On 2 June 2011 we lost a soldier....geronimo ji jaga. It's no exaggeration to say that without geronimo's initial efforts, the Angola 3 Coalition would have never existed. 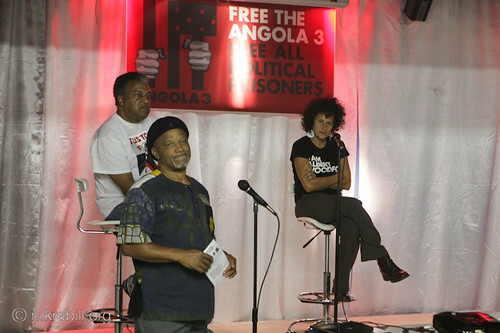 In 1997, Colonel Bolt, who had spent 20 years in CCR with Herman Wallace, Albert Woodfox and Robert King, went to geronimo's release party to talk to him about the Angola prisoners, and so the campaign to free the Angola 3 was born. From that moment on, the effort took on a life of its own, but geronimo ji jaga was always there to support. In 2001, geronimo provided us with a statement of support for the Angola 3 Coalition's first newsletter. It barely seems possible that just a few weeks ago, geronimo attended the commemoration of Herman and Albert's 39th year in solitary confinement in New Orleans. geronimo's generous nature and philanthropic efforts were given full reign during his fourteen years of freedom. His work through the Kuji Foundation, which he founded, and his deep ties to Africa are just two of the many highlights of what he contributed during his years in minimum security. We are thankful that his passing was swift and know that those of us whose lives he touched will forever keep him in our hearts. To the thousands of political prisoners in America's Gulags his contribution is an inspiration and his warrior spirit lives on wherever freedom struggles continue. geronimo speaks at the recent A3 event in New Orleans. Robert King Wilkerson, Albert Woodfox, and Herman "Hooks" Wallace are very dear to me because they come from my home state of Louisiana. The Louisiana chapter of the Black Panther Party was one of the best chapters we organized and they were some of our best, most disciplined soldiers. They were the kind of soldiers who never cried out to anyone for help, even though they were facing life imprisonment. Understand that after being in that kinda situation for so long, I can personally attest to the highly disciplined and dedicated nature of these askaris. They endured, and they survived, over all the years, with very little help from the outside world. They are the kind of unsung heroes who we must come forward to help, because they never asked for anything from us in exchange for suffering what they have suffered. To Struggle for the People and not expect anything selfish in return is a rare thing and this is what King, Wallace, and Fox have personified throughout all those hard years. They most certainly deserve our strongest salute. There will be a memorial service at 10AM on June 18 at the Morgan City Auditorium in Morgan City, Louisiana, geronimo's hometown. For more info call Jones Funeral Home at: (985) 384-8643. 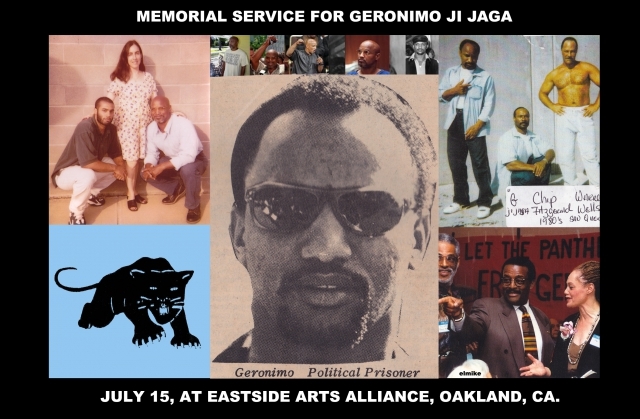 There will also be a memorial service for geronimo at the Eastside Arts Alliance in Oakland on July 15th at 6pm. 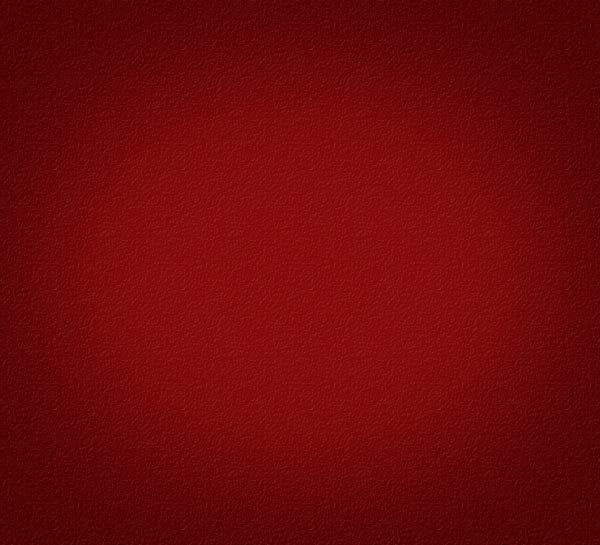 This is a celebration of the life of a Revolutionary. East Side Arts Alliance is located at 2277 International Blvd. For more info call Billy X at (916) 455-0908. 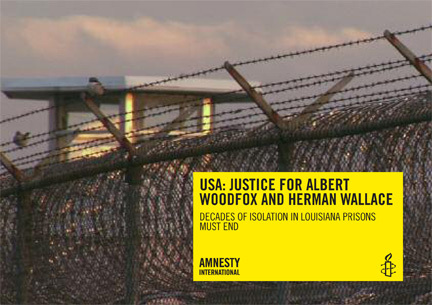 At the other end of the emotional spectrum, Angola 3 have been blessed by Amnesty International launching a global campaign calling for the authorities in the United States to end the solitary confinement of Herman Wallace and Albert Woodfox. They state that "the treatment to which the two men have been subjected was 'cruel and inhumane' and amounted to a violation of the US' obligations under international law". Guadalupe Marengo, Amnesty's deputy director for America said "We are not aware of any other case in the USA where individuals have been subjected to such restricted human contact for such a prolonged period of time,". Amnesty has also raised questions about the legal aspects of the case including the lack of any physical evidence linking Herman and Albert to Brent Miller's murder, lost DNA evidence and convictions based on questionable inmate testimony. Amnesty is calling for people around the world to contact Governor Jindal via email or post and let their outrage regarding this injustice be heard. The spotlight on injustice which Amnesty International is now shining on the case of the Angola 3 is a monumental step of support to the campaign. We hope Albert and Herman's supporters will lead the charge in responding to Amnesty's call for action. Below is the full press release, also available online . For more information or to arrange an interview with an Amnesty International expert, please contact: Josefina Salomon,jsalomon@amnesty.org, mobile: +44 7778 472 116.